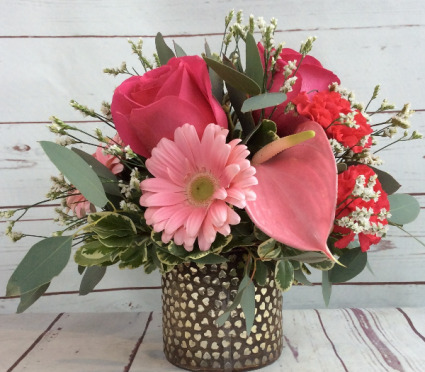 Red or Pink Tropical Anthurium, Red or Pink Roses, gerber dasies, silver dollar eucalyptus & white caspia arranged in a metal vase covered in gold hearts. The 3 price points are for additional Tropical Anthurium Blooms. Measures app 12"x10"
Metal Heart Vase, Foam, Var Pitt, Red Or Pink Roses, Gerbers Pink, Euc, Caspia, , Or Anthurium Based On Price Point. 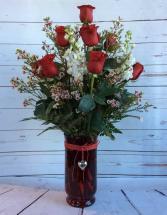 Red Glass Vase With Silcer Heart Pendant, Red Roses, Greens, Purple Limonium. 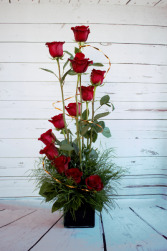 Price Point, Roses, Spray Roses, Alstromeria, Mini Carnations, Dasies, Bb, Tree Fern Or Fluffy Fern, Baker. Roses Cm, Tree Fern, Lemon Leaf, Foam, Flat Wire, Red Glass Cube.